When Rob Sivulka asked me to review Church Ball, I immediately thought of White Men Can't Jump. I mean, an LDS basketball team. What color would they be? I thought that would be a good line as I've seen so few blacks in Salt Lake City after moving here. But as the movie unfolded, it became apparent that it's another SLC--Slick Like Con--by the producers. Hey, LDS, multicultural, PC, we got midgets in wheel chairs too, see? Yeah, I did. So speaking of PC, what's the gig with appealing so much to blacks? I mean I saw it in Suits on the Loose, and Joseph Smith The Prophet of the Restoration. Why are the LDS trying so hard to make themselves look good to blacks? That's good. I guess the LDS have a special place for blacks. Though there are no blacks who are members of the Church's general authorities, they are certainly encouraged to become basketball players for "Church ball." Dude! I mean we've got to win; we are LDS! Plot: Church Ball is about how LDS church leaders create a great way to bring the clan (oh, that's not such a good word)--the members of the LDS Church--together. Yeah, and not only that, but how to recruit non-LDS and get converts. The LDS leadership introduced Church Ball to create camaraderie and fellowship and love and such. Ah, but mothers of all monkey wrenches, men got in the way. It's almost as if the LDS are depraved. Funny, that's what Christ taught in the Bible--all men are depraved. And that's why only He can save having paid it in full. He uttered the Greek word tetelestai on the cross: "It is finished." And the good news, the gospel says: hey, all you have to do is put your trust in Jesus, not some organization and then work your way up the corporate ladder to the Celestial Kingdom. Jesus, the one and only second member of the one and only Triune God paid it all. You don't have to even win in Church Ball to get into His presence. By the way, the way LDS play basketball--is it play or is it war? Watching them play, I mean fight, it's not safe out there. And what was with the Polynesian jibes; who threw that in? Who's the guilty party, I mean racist: the writers, director, or producers? Who decided to throw in the human whale team--blubbery Polynesians? Kowabunga, talk about racism and stereotyping. Good grief! They've got something against the South Seas folks? Humorously, or humorlessly, they throw in a scene of a human wedge--Polynesians moving down with a scrawny shooter who follows behind their wall of wiggly humanity steam rolling over the heroes, and then skinny tosses in an easy two-pointer. Oops--LDS white boys can't jump, but Polynesians can just mow them under foot? So the LDS leaders' goal of fellowship morphed into a bad idea of war on the floor? Yup. It got so bad, so depraved out there that the LDS leaders had to ban church ball, basketball that is. So this is the twilight of church ball. No more games, I mean battles, no more trophies, and no more "camaraderie." This is it... win or lose there will be no more seasons. This ratchets up the win at any cost motif. But in the end it all pans out. And in the end it's the love of the LDS that prevails and everyone is happy... well almost everyone. More stereotyping run amok. The black hat bad guys are rich, in-your-face obnoxious sue-happy attorney bio-brothers--guys easy to hate. They were not happy. And I could sense they were not about to send a Kwanzaa card in December to the heroes of Church Ball, members of the Mud Lake Chapel. But confusingly, the "good guy" team is just as bad, just as in-your-face, just as obsessed with win-at-all-costs, and just as obnoxious. In fact, the only thing making them different from the bad guys is money--the bad guys have it, the good guys don't. Gee, is that all the difference there is in LDS Church ball teams--money? 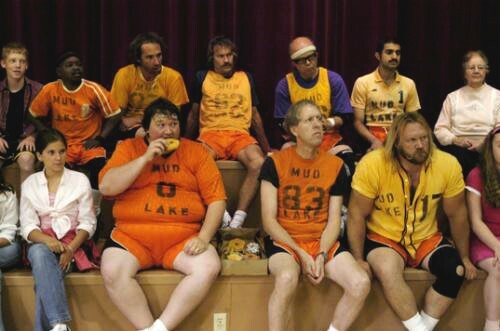 Church Ball should be rated D for dull and S for sophomoric and LDS for Lotsa Dopey Scenes. I saw no saints in this movie. From watching Church Ball, it means win at any cost including deleting key portions of the LDS story towards the blacks (just lie and be winning blacks into the LDS fold). But what about the Polynesians being typified as human whales? Was that to encourage more Tongans, Samoans and Hawaiians to join the church? You're right... what do I know? I'm just a transplant from San Diego. I patiently endure the LDS stereotyping against my wife and me in our Draper-hood. Down south, Jews calling us "Goys" (Yiddish for "non-Jews"), but up here LDS calling us "Gentiles." Somebody please make up your mind. Just call us Christians saved by grace, through faith by Jesus' tetelestai. For more information on Church Ball, see here, here, and here.